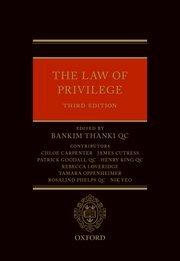 The Law of Privilege is now in its third edition. I have been reading through it and planning a review for some time. I came across the decision, on BAILLI today in Fleming v East of England Ambulance Service NHS Trust  UKEAT 0054. A case that shows issues of privilege can become significant in every area of litigation. This case, coupled with the recent Court of Appeal decision in Kerman v Akhmedova  EWCA Civ 307 shows that there is a pressing need to have a definitive guide to the law and practice of privilege to hand. I prefer a direct style of book review. Basically readers want to know if they should buy the book or not. Well, if you are in practice then, at some time during the year, you are going to need (or wish you had) this book. Privilege is one of those issues that crops up in all areas of litigation, usually unexpectedly and mostly in an extremely unwelcome context . The issues require answers, invariably they require answers quickly. This is a magnificent piece of scholarship. However, if you are a practitioner, don’t let the term “scholarship” put you off. This is a practitioner’s book. It provides easy access to the particular subject that will be causing concern when consulted. The editorial team ensures that the authority of the work is beyond doubt (Bankim Thanki QC, Chloe Carpenter, James Cutress, Patrick Goodall QC, Henry King QC, Rebecca Loveridge, Tamara Oppenheimer, Nik Yeo, and Rosalind Phelps QC). The chapter headings (and sub-headings) show the breadth and depth of the book. Legal professional privilege: Fundamental Principles. Legal Professional Privilege: General Issues. Joint and Common Interest Privilege. A practitioner, in a hurry, will have no difficulty in finding the precise issue. Taking this chapter as an example. There are five major headings together with a number of sub-headings. Restraining the use of Privileged or Confidential documents. (1) A witness statement served is subject to the collateral undertaking under CPR 32.12, this will prevent any use of the statement, except for the purpose of the proceedings for which it is served. (2) There is no equivalent protection under the CPR for affidavits. The way that privilege can be waived in statements of case and witness statements is also explored in detail. The applicant brought an action for unfair dismissal. He wished to rely on his recording of conversations involving internal panel members during the breaks in a disciplinary hearing which took place on 13/8/15. The Employment Judge ordered that he could not rely on the recording for any purpose at the Full Hearing on the basis that its contents were “private/legally privileged”. The issue before the Employment Appeal Tribunal was whether the recording, or all of it, was subject to legal professional privilege. His Honour Judge Shanks considered the arguments. (1) Legal professional privilege covers confidential communications between a lawyer and client for the purpose of giving or obtaining legal advice. (2) “Legal advice” covers all advice given by a lawyer in her capacity as such (Three Rivers District Council v Bank of England (No 6)  1 AC 610). (3) The privilege is absolute; it belongs to the client and can only be waived by the client. (4) The privilege does not apply where the purpose of seeking or giving the advice is to effect “iniquity” (Barclays Bank plc v Eustice  1 WLR 1238). (5) “Iniquity” involves conduct which goes beyond a mere civil wrong: there must be something akin to sharp practice or fraud or something which the law treats as entirely contrary to public policy (BBGP v Babcock  Ch 296). I have considered the references to the advice given by the Trust’s solicitors and the contents of the conversation between Mrs Shah and Mr Ashford (and Ms Adams) during the second break and am satisfied that they are, on the face of it, privileged, but I can see no basis for saying any other parts of the recording are privileged. Ms McCafferty suggested that this was a case where the purpose of seeking or giving the advice was to effect iniquity but the evidence does not, in my view, come close to showing that the purpose was to effect “iniquity” as that term is used in the authorities. Further, it is clear that, at least on 13 August 2015, if there was an iniquitous scheme, Mr Ashford and Ms Adams were not part of it and did not seek or refer to any advice from the solicitor with a view to carrying it out. In my view therefore the claim to legal professional privilege advanced by the Trust is valid. Unless privilege is waived, Mr Fleming may not at the Full Hearing before the ET make any use of (a) references to the solicitor’s advice in the course of conversation between Mr Ashford and Ms Adams or (b) any part of the telephone conversation between Mrs Shah and Mr Ashford (and Ms Adams). (1) The fact that such evidence is the product of a covert recording is not in itself a ground for not admitting it. (2) There is however an important public interest in preserving the privacy of such deliberations; otherwise, full and open discussion may be inhibited and the integrity of the outcome may be undermined. (3) When a party seeks to rely on such evidence a balance must be struck between that public interest and the public interest in litigants being able to avail themselves of any relevant evidence. (4) The balance must be struck having regard to the particular circumstances of the case; that may involve a consideration of the nature and quality of the deliberations on the one hand and the value and weight of the evidence on the other. (5) In a discrimination case where a panel gives no reasons and the only (and incontrovertible) evidence of discrimination comes from a recording (or evidence from one of the panel members) of the panel’s private deliberations, or where such deliberations show that the panel are simply acting under instructions from management, it is likely that the evidence will be admitted but there are no hard and fast rules and a balance must be struck in each case. Turning to this case, and leaving out any consideration of the parts of the conversation subject to legal professional privilege, it is right to say that the discussions recorded were not expressly stated in advance to be “private deliberations” (as in Amwell) and that they were not final deliberations. However, they were all (including the discussion between Ms Adams and the note taker) directly related to the hearing the panel was carrying out and the decision it had to make about how to proceed and it must have been in everyone’s contemplation that such matters would be discussed by the panel members during any breaks while the parties were absent and that such discussions would be private. In my view there is therefore a strong public interest in preserving their privacy. Ms McCafferty maintained that some of the statements made in the course of the conversation, in particular by Mr Ashford, were “uniquely probative” of the issues in the claim because they contained “direct evidence of discriminatory and offensive attitudes to Mr Fleming’s disability”. Although they may have some probative value in relation to the complaint of discrimination, I am afraid I cannot accept that they provide “uniquely probative” or incontrovertible evidence of discrimination. The comments relied on clearly arose from Mr Fleming’s behaviour and state on the day, not from the mere fact of his disability; it is fair to say they express some exasperation (both with his behaviour and the difficult situation the panel found themselves in) and that some of them are not expressed in an ideal way, but the panel were deliberating as they thought in private and it is noticeable that they also express some sympathy for Mr Fleming’s position and that the course taken by Mr Ashford does not indicate any kind of animus against him. In the circumstances, if the events of 13 August 2015 had been “the end of the story” I would have had no hesitation in deciding that the public interest in preserving the privacy of private deliberations prevailed in this case. However, the fact is that Mr Fleming listened to what had been said in the breaks and let Mr Ashford (and indeed Ms McCall) know his views about what he had heard before the decision was taken to dismiss him. It does not seem to me that that decision can be properly assessed by the ET without reference to what happened after the meeting and to the actual content of the discussions which led Mr Fleming to adopt the position he did (save, necessarily, in so far as they are privileged). In those unusual circumstances it seems to me that the balance is tipped in favour of the admission of the evidence of what was said in the breaks. For clarity I should say that the effect of this decision must be, I think, that Mr Fleming is able to rely on this evidence for any purpose, including to support his case that the disciplinary procedure was inappropriate and that Mr Ashford was motivated by a discriminatory attitude towards him. I therefore rule that Mr Fleming should be allowed to present evidence to the ET about what happened during the breaks and his reaction to it, except in so far as it is covered by legal professional privilege as set out above. Any transcript produced or recording played at the hearing will need to be carefully checked to see that it does not disclose privileged material and there may need to be careful editing of the documents in the case and Mr Fleming’s witness statement. I would recommend in this connection that there is a further case management hearing before a different Judge to the one who is to deal with the final hearing to make sure there are no “crossed lines”. Aa solicitor was summonsed to give evidence in financial remedy proceedings. He was summonsed by the wife. The solicitor had acted for the husband. The summons prevented him from discussing the summons itself (except for the purpose of taking legal advice). The solicitor appealed, arguing that the information he held was subject to legal professional privilege. The appeal was dismissed by the Court of Appeal. “I return to the first ground of appeal, relating to legal professional privilege. The law relating to legal professional privilege is well-settled by the authorities: see, in particular, Three Rivers District Council and others v Governor and Company of the Bank of England (No 6)  UKHL 48,  1 AC 610. The overarching principle is that confidential communications between client and solicitor for the purpose of obtaining legal advice – what the client tells the solicitor and what the solicitor advises his client – are privileged from discovery or disclosure. Legal professional privilege, once established, is absolute and permanent. It confers on the client, as the person entitled to the privilege, the right to decline to disclose or allow the disclosure of the confidential communications in question. It is long established that it is the duty of the solicitor to defend the client’s privilege. It is long established that there is an exception – what for shorthand I will label the ‘fraud exception’ – where legal professional privilege does not apply: see The Queen v Cox and Railton (1884) 14 QBD 153. Before Haddon-Cave J the controversy centred on two issues. One was whether, in relation to the matters on which he was being questioned, Mr Kerman had been acting qua legal adviser or qua man of business. The other was whether the ‘fraud exception’ applied. Before us, Mr Shepherd challenged Haddon-Cave J’s findings on both issues. “16 In my view, the arranging of insurance is something that a “man of business” would do for a client rather than qua solicitor. Arranging insurance is a fairly routine matter, involving instructing brokers. It would not generally involve giving legal advice … I am not persuaded by Mr Warshaw QC that the possibility that a client might have asked a lawyer “what to do” with a valuable asset necessarily cloaks the mere arranging of insurance with a “relevant legal context”. 17 There was very little argument on whether there was a “relevant legal context” as to any communications between H and [Mr Kerman] as regards [Cotor]’s monetary asset. In my view, advice or assistance given by [Mr Kerman] to H in relation to [Cotor]’s bank accounts with [UBS] again is more redolent of something that he would do as a “man of business” rather than qua solicitor. “20 In the light of these findings, it is clear in my view, that the fraud or “iniquity” exception applies in this case. H’s conduct has been seriously iniquitous. He has displayed a cavalier attitude to these proceedings and a naked determination to hinder or prevent the enforcement of W’s claim. There was ample evidence of this prior to my first ruling on 16 December (see above). The picture was subsequently compounded by [Mr Kerman]’s subsequent revelations of the recent steps which H has taken to hide the modern art collection and [Cotor]’s portfolio in [Liechtenstein]. In my judgment, H’s conduct is such that it is plain that legal professional privilege should not attach to his communications with [Mr Kerman] regarding the modern art collection and [Cotor]’s portfolio of financial assets. There is, in fact, another point, canvassed before Haddon-Cave J though not perhaps with the emphasis it deserved, which, in my judgment, is determinative of the issue in relation to privilege. As Mr Dyer pertinently pointed out to Haddon-Cave J, if these questions, or the questions about the Cotor portfolio, had been put to the husband, he would not have been able to rely on legal advice privilege as a reason for refusing to answer; he would have been ordered to answer. Why then, he said, should Mr Kerman be able to rely on a privilege which would not available to his client – and, one might add, a privilege which, it is elementary, is the privilege of the client, not the solicitor. To this point, Mr Shepherd had, at the end of the day, no effective answer. Indeed, he had to concede, rightly in my judgment, that communications between a solicitor and a third party are not privileged. “65 … Communications between clients and third parties, such as professional advisers who are not lawyers, are not subject to legal advice privilege. Interposing a lawyer in the chain of communication will not improve the client’s chances of claiming legal advice privilege. I respectfully agree with that. It follows, in my judgment, that this is why the appeal on this point fails. Moreover, says Mr Shepherd, Haddon-Cave J did not (Z v Z, para 20) find the husband’s conduct to have been fraudulent or dishonest, nor on his findings of fact (Z v Z, para 19) would he have been entitled to. There is no need for us to decide any of these points, and it is better that we do not. I confine myself to two observations. The first relates to the decision in Gamlen. It is clear reading the Transcript as a whole that the entire argument proceeded on the assumption that what had to be established was fraud or dishonesty, just as it is clear, having regard to the structure of the judgment, that the crucial passage in Goff LJ’s judgment upon which Mr Shepherd relies was obiter. Given the decision in Williams v Quebrada Railway, Land and Copper Company  2 Ch 751, which, so far as I am aware, has never been questioned, it is not easy to see why the actual decisions in Eustice in relation to section 423 of the Insolvency Act 1986 and in C v C (Privilege) EWHC 336 (Fam),  1 FLR 115, in relation to section 37 of the Matrimonial Causes Act 1973, should be questioned, whatever criticisms there may be of some of the reasoning.